After the War for Israel’s Independence in 1948, the Kottel, or Western Wall, came under Jordanian control and Jews were not allowed to visit their holiest site. Article VIII of the 1949 Armistice Agreement guaranteed that Jews would have access, but Jordan refused to honor this clause. 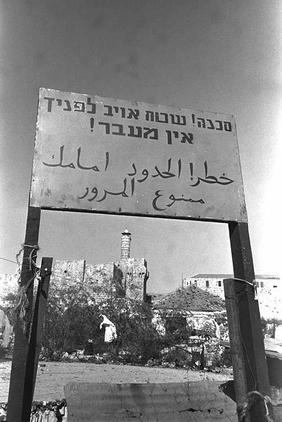 From 1948 until the great miracle of the Six Day War, we weren’t allowed to visit our Holy Wall. This was a waiting period of 19 years! Finally, events unfolded that would fix the situation and irrevocably change the status quo. In 1967, the capital city of Jerusalem was surrounded on three sides by the artificially created country of Jordan. I was a young rabbinical student going to school in Jerusalem. The program at the Seminary gave us a full schedule, but Friday afternoon, before Shabbat, we were “off”. What does a rabbinical student do in his time off? It wasn’t “R.C” (Religiously Correct) to go to the movies or a bar. On the other hand, just five blocks away was the famous Mandelbaum Gate. That was a crossing from Jordan into Israel. We liked to stand as close as we could get on the Israeli side and stare at the Jordanian Legionnaires, enemy soldiers, standing opposite us in spiffy uniforms with large rifles. Tensions were rising. At that time, even my parents, who were very big Zionists, contacted me with the suggestion that maybe it was a good time for me to move to Tel Aviv because it would be safer. Even they knew that war was imminent. I refused. Now, our large Yeshiva building, so close to the border and with a huge backyard, was taken over by the Israeli Defense Force, the IDF. They dug three huge foxholes in the grounds and put three large mortar guns in the foxholes. About 40 soldiers then moved in, although the war was not to start for another two weeks. You must understand that since we were so close to the border the soldiers recognized the value of the Yeshiva. They wouldn’t have to aim their weapons. Mortar shells could just be lobbed in the general direction of “Jordan” and you were sure to hit the enemy. The American Embassy sent a memo, then a second and then a “Final Notice” to all American Citizens in Israel. It was actually pretty awesome. It went something like; “WAR is imminent! No transportation will be provided! Leave the Country NOW!” You get it; short, direct and to the point. We understood the memo, but what many don’t know is that at that time the airport was crowded with Americans who were already trying to leave. On the other hand, the religious orthodox Americans had a serious moral dilemma: What to do? Was it morally justifiable to leave? We Chasidim, who were disciples, followers and devotees, of our great Spiritual Moses icon, the Lubavitcher Rebbe, also weren’t sure. I’m an only son, born to elderly parents post Holocaust, after they found out that most of their siblings and their spouses and their children had been murdered. Three of my four grandparents were murdered by the Nazis. You get the picture; I was painfully aware of the distress that I could cause my parents. I began to entertain pessimistic ideas about someone ringing my parent’s doorbell back in Atlantic City and telling my mom the bad news about her 21 year old, her only son, who had been killed in the most recent war in Israel. The following Sunday, before the War started, a large cattle truck pulled up to our Yeshiva and asked for volunteers for non-combat work. Without a second thought, I went with 30 from the Yeshiva student body and we climbed into that dirty cattle truck with absolutely no idea where we were going or what we were supposed to do. 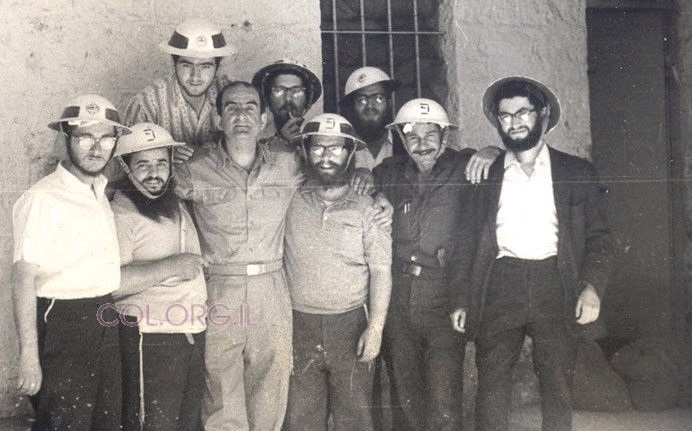 Being young Chasidim, we trusted in the Rebbe’s blessings and our enthusiasm to help the war effort was greater than our thoughts of self-preservation. It turned out there were some new apartment buildings that didn’t have a shelter. Worse still, they were right on the border, next to a huge open field that led to Jordan. We were informed that it was now our job to dig trenches for the people living in these new apartments. Soon, I learned something. Before you dig trenches, you have to remove the larger rocks in the field. And they didn’t give us gloves. After a few hours, all our hands were bleeding. There was one soldier with a pistol and he had to supervise our group of Torah scholars. It was pretty obvious that he really didn’t like babysitting us young, orthodox, spoiled Americans. Around noon I noticed that he was standing at the end of the property and letting us boys look through his army binoculars at Jordan. I had to get in line and see for myself. At my turn I saw that the “abandoned” buildings, in Jordan, which were about one block away, had a nice amount of people on their second story roof and they were looking at us with their binoculars. It was a little unsettling and I suggested that now was an opportune time to break for lunch. Instead, I received a really dirty look from our commanding officer, who barked, “Just keep working!” By this time, the trenches were about knee deep. My intuition had not failed me. Perhaps ten minutes later, for the very first time in my life, I heard and experienced the sound of machine gun fire and it was directed at me. All of us leaped into the freshly dug trenches, whose security, we had just created by the blood of our hands. During those exciting moments, I started entertaining many thoughts and once again some more pessimistic visions. A strange thought occurred to me that in many ways it almost didn’t matter if there was a war, or who won. I had just seen the reality. Even if Israel won, our new neighbors could so easily just walk one block and take us out. My group of unarmed Yeshiva boys couldn’t have beaten them, and if this happened on that very day, we wouldn’t even know the outcome of the War. Meantime, there was nothing we could do. The small arms fire increased its intensity and bullets were clearly directed to us. I hated not being pro-active at such a time. Then, I had this brilliant idea. I started singing an uplifting, happy Chasidic melody! Immediately the rest of the students joined me. As you can imagine, our commanding Officer went ballistic. I don’t really know what he screamed at us in Hebrew. We all knew that the Jordanian soldiers clearly saw our position, so what difference did it make? Truth to tell, we were far away from the main part of the City, on the desolate outskirts. We weren’t sure that anyone knew we were in trouble, that we were still alive or that we were being fired upon. Thank G-d almighty, after ten minutes, we heard returning fire from Israel. After another five minutes, things quietened. Then Israeli army jeeps, with huge machine guns in the back, pulled up into the dirt field about a half block away. We were told to crawl in the dirt of the field, not something I was used to, but a solider accompanied us to the jeeps and we were taken back to the Yeshiva. Now that we had the IDF at the Yeshiva, the Yeshiva phone needed someone to await calls at all hours of the night and day in case of official business. The night after being shot at, turned out to be the last night before the war and it was also my turn to babysit the phone. I was fine with this in theory, yet they never really told us what to do if the phone rang. Certain that I was hallucinating, I struggled to answer, “Speaking.” And it was my parents wanting to know, “Whassup? !” So, I told them that the idea of a war was all a bunch of hype and the media was blowing everything out of proportion, and everything was really just fine and dandy. We had a great call and I felt great about reassuring my concerned family that everything was settling down. The next day the War started. It was Monday morning and by Wednesday, we could only hear explosions in the far distance. It was the beginning of June in the Middle East, the sun was shining, and it was truly a warm and beautiful day. Gradually we floated outside onto the quiet deserted street. It certainly seemed that the War was moving away from our neighborhood. It seemed that it was already over. We knew this was unrealistic, but after being incarcerated for almost 72 hours, and having survived a never to be forgotten bombardment that had lasted for four solid hours on the first day, you can understand our feelings. It was a deep pleasure to stand outside in the quietude of the glorious blue Israeli sky. Nature coerced us into meaningful thoughts of mortality, spirituality, personal goals and thoughts of grandeur. I cannot tell you how we were welcomed by the panic stricken, traumatized women and children. And then, quite suddenly, a new bombardment started. This was very close to the two shelters were close to 80 people were already in a high state of nervousness. War is not pleasant. The war was over in six days. Even then, the IDF would not allow civilians to reach the Kottel because there were mine fields leading to the Wall. The Arabs were clearly aware that after they had deprived us of visiting our most hallowed site for 19 years, there would be a rush to the old city. They had therefore prepared a welcome with mines which they hoped would kill and maim us. All the paths, all the shortcuts that the older generation remembered, were fully supplied with anti- personnel mines that were designed to cause maximum injury that would burden us, and hurt our new population as we rebuilt the country. It took our army a full two weeks to clear out the explosives. We had to wait. This wasn’t the time to be adventurous and we knew that if the Good Lord , Almighty G-d , had saved us with the miracle of the Six Day War, we could not be a nudnik to the Almighty. I’ll conclude with the incredible mind-blowing, never to be forgotten scene, when the IDF finally permitted us to touch the Holy Wall. That was a long time ago, although everyone who was an eyewitness remembers the event vividly. That includes me. This is how it happened. It was the Holiday of Shavuot and I was with a group of 30 young men who were studying Torah through the night, as is the custom. Around 4.30am, a strange noise was heard outside the study hall of the Yeshiva. We quickly looked out our very small window at the narrow street below, Mayeh Sharim Street. There, we could see a quickly moving mass of humanity who had totally filled the ancient, narrow street. Their shoes were shuffling in the ancient cobblestone streets and this was making the strange noise. We didn’t have to verbalize the obvious question. We just looked at the first Jew who made eye contact and he confirmed the news. 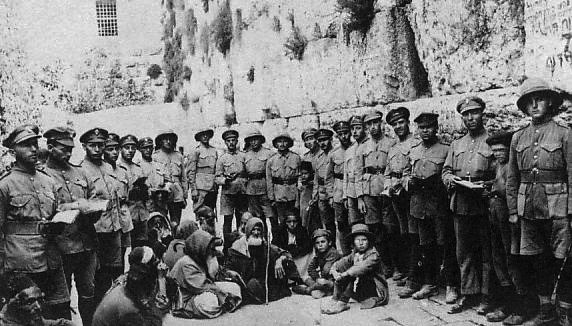 The army had finally cleaned up a longer, but safe way to reach the Kotel. We ran to the mikveh and then raced to join what appeared to be a rushing river of thousands. As we were being directed along the safe path by the soldiers, dawn was approaching and the excitement rose with it. We blended into the growing crowd; the excitement was palpable. Almost no-one talked, which you have to admit is strange in itself, but this was the spontaneous reaction to the event. We were a unified group with a single purpose. And then we reached the Wall. There were already two rows of Jews spreading across the space in front of the Wall. It was still getting light, although the sun hadn’t fully risen. The sound was painful as we wept and we prayed and we poured our hearts out. I watched in wonder. It was intensely moving to be there and observe everything. All the while, hundreds more people continued to arrive and each group started their own service. It was the first time that I realized a cacophony can be a positive sound. I listened to the different melodies carrying heart-wrenching, devotional, sincere prayers. This was now Shavuot and the timing couldn’t have been better synchronized. Our prayers, the holiday, the sounds were all painful, yet joyful at the same time. It was about four hours later, with the sun fully beating down on us, and we had prayed up a good storm, that we headed back to our dorm. When we turned around from the Wall to return, we saw that the river of people had further grown about five times in size. Of course! This was the first Shavuot in 19 years that the Jews were permitted to pray at their holiest site on G-d’s Universe. What a Shavuot! I have been blessed with many Shavuot holidays since then, but none have captured that mesmerizing event when we touched the unreachable and were truly unified with so many Jewish souls. In fact, it was 48 years ago on June 11th.